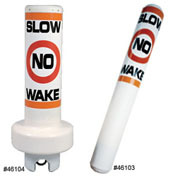 A Taylor Marker Buoy offers high performance design, stability and high visibility. Mark swim areas, No Wake zones, Hazards, and other dangers. Measures 47 1/2″ high with a column diameter of 10″. Large ring is 18″. Buoyancy is 40 1/2 lbs. CW Marker BuoyMarker Buoy is foam filled for stability and high visibility. Made with a long lasting Stainless Steel connecting pin. Self-righting with twenty lbs internal ballest. Mark swim areas, Channels, No Wake zones, Hazards, and other dangers. Measures 47 1/2″ high with a column diameter of 10″. Large round ring is 18″. Made in white, green and red. Sur-Mark Regulatory Buoy Taylor Regulatory Buoy is made out of white polyethylene with closed cell foam inside. Measures 61.25″ high and 8 1/2″ in diameter. 37″ shows above the water line. Mark swim areas, No Wake zones, Hazards, and other dangers. Buoy Labels Label are fade resistant and highly visable. Sold in pairs. Two labels required per buoy. 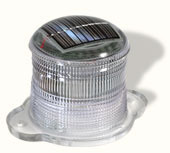 The Model SL 15 is a multipurpose solar-powered marine light suitable for virtually any low intensity navigation or hazard-marking requirement. This unit is completely waterproof, vibration-proof and vandal-resistant. It is designed for autonomous operation without any maintenance (ie. bulb or battery replacement) for up to 5 years. The SL 15 is available in green, red, amber and white output with one of seven standard IALA flash patterns including stedy on,up to one natical mile of visability.Turns on automatically at dusk and off at dawn. Installs in minutes using three screws or bolts. No external wiring, cable trenching, etc. Uses LEDs (light emitting diodes) with approximately 100,000 hour lifespan. No bulbs to replace… ever.